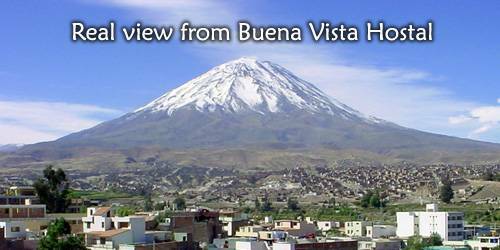 We named our hotel 'Buena Vista' for one simple but important reason: OUR GREAT VIEWS ! 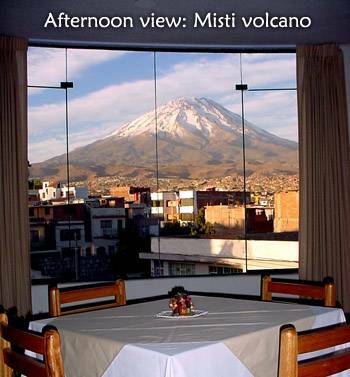 Yes, in our hotel you can enjoy great panoramic views of the city and the three volcanoes surrounding Arequipa. Just imagine... sipping a coffee and getting energies back in the morning after a fantastic sleep with the superb view of the Misti volcano... sounds perfect! 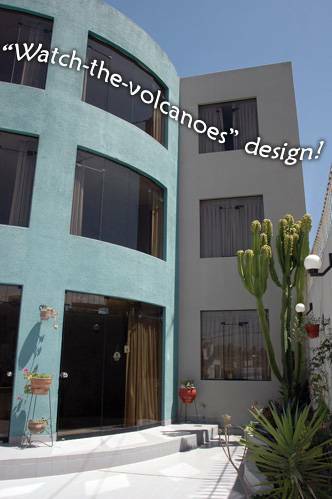 And it's true, we offer this unforgettable experience combined with a great stay in comfortable beds and rooms. 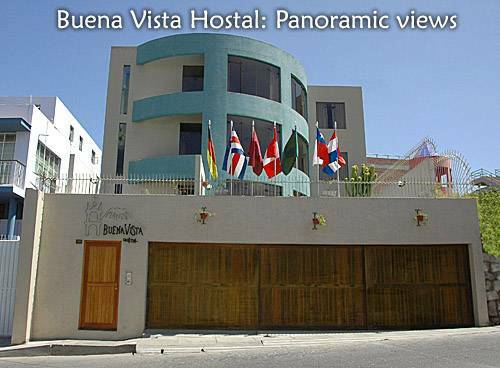 The BUENA VISTA HOSTAL is located in the traditional suburb of Yanahuara, a residential and quiet area of Arequipa, very close to downtown and with easy and quick access to all the transport stations. We are just a few blocks away from downtown, reasonably away to be out of the daily traffic noise, but close enough to explore the city colonial pearls by walking and experience the active nightlife. Yanahuara is a charming and secure neighbourhood... with old streets and churches and the also famous lookout 'Mirador de Yanahuara' which we defeated in view quality! We are also very close to a Mall with shops, supermarkets, department stores, traditional and fast-food restaurants, banks and cinemas. And best of all with your stay you will get a FREE unforgettable experience in Arequipa, because we'll do our best to spoil you and make your trip a life memory... this is our commited service!! (*) Get these offers for free (transfer) with a minimum stay of two nights! All rooms are ensuite. Private bathrooms have shower with hot water 24 hours. 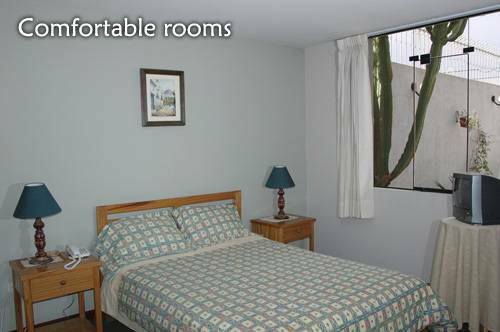 Rooms feature comfortable beds, ample wardrobes, Cable TV, telephone, WI-FI internet access and carpeted or wood floor on your choice. They feature the local dish Adobo, a specialty! 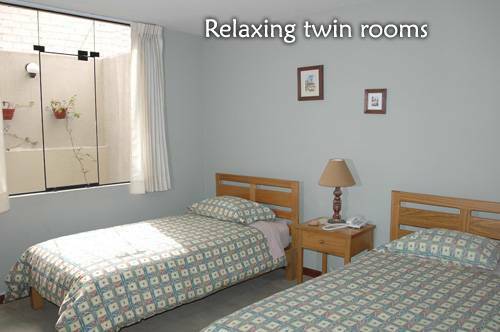 We are just 10 minutes away from the airport and 7 minutes from the bus stations (Terrapuerto and Terminal Terrestre). If you want to reach our hotel by yourself, you need to get access to one of the main avenues in the city, Avenida Ejercito, which links the city with downtown and outskirts. Once there, a few blocks from Puente Grau (bridge), look for corner with Quesada street and turn here and go up ahead until you find the 6th block of Ugarte street (which is the same street with different name, the first blocks named Quesada then Ugarte). Local transport options are plenty: buses, combis (minibuses) and taxis. You can take a combi just right outside the hotel and wander around the city.